Blood donation never decrease your strength and you recover same level of blood in few days. 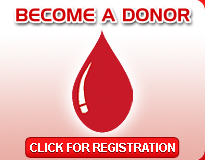 If you are regular donor then each time donation gives you surplus blood. There are some useful tips for happy blood donation process. Drink extra water before donation to fulfill the blood volume but don’t take tea, coffee or other beverages with caffeine. If you are not feeling good on the day of donation, don’t give blood and wait for your well feelings. Drink water or any other juice for refreshment but don’t take alcohol. Take extra quantity of liquid in the next 24-48 hours after donation. If bleeding occurs after removing the bandage, rise your arm for 4-5 minutes and apply cold pack. If you feel headache, please take rest and lie down until headache pass away. Take care for your daily food and eat properly and regularly after donation. Enjoy good time with these feelings that you have saved a life.